In 2018, the APHA International Development (ID) team was established within the Science Directorate to develop new engagement strategies at an international level and to enhance the status and outreach of the agency. During the course of the past year, the identification of the risks and opportunities that EU Exit presents to the agency and particularly to the Science Directorate have become an important part of the ID team’s work. 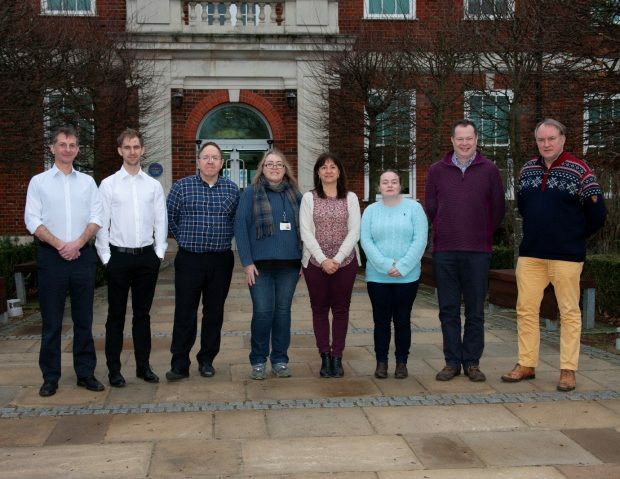 The International Development Team, from left to right: Rod Card, Barnaby Haire, Charlie Dalley, Michaela Giles, Anna La Rocca, Kelly Kinsella, Christopher Finnegan, Tony Fooks. The team, led by Professor Tony Fooks, has worked in close cooperation with colleagues across APHA and Department for Environment, Food & Rural Affairs (Defra) to deliver on a range of challenging priorities in 2018. A few examples of the team’s achievements are given below, illustrating how it has contributed to the UK’s preparations for day one of EU Exit and engaged with new partners at an international level. One key priority for the UK is the continued ability to trade and move animals and animal products to and from EU countries in an efficient and safe manner. EU Exit has the potential to severely impact this trade, one aspect of which is changes to testing requirements to demonstrate freedom from disease. The ID team has played a pivotal role in helping to identify and mitigate issues surrounding such testing. For example, the impact of EU Exit on the PETS travel scheme for rabies testing may be profound, as indicated in recent government advice. The ID team, together with colleagues in the Virology Department, successfully delivered a detailed plan of the additional resources needed including staff, training, reagents, equipment, and facilities, to meet the expected increased demand for testing in support of changes to the PETS travel scheme. Importantly, all the rabies testing is undertaken in a dedicated high containment laboratory facility managed by the Virology Department that ensures ongoing safety for APHA personnel, the public, and the environment. Assessments of testing capability and capacity requirements have also been undertaken for the movement of livestock species including equines, poultry, cattle and pigs. Mitigation measures, such as the establishment of new diagnostic tests, are now being implemented. Leaving the EU will result in the UK losing access to the EU vaccine bank, a pooled resource that gives member countries access to vaccines against high-consequence transboundary animal diseases for emergency use during a disease outbreak. These include foot-and-mouth disease, lumpy skin disease and classical swine fever. In liaison with Defra policy teams, the ID team had a central role in the establishment of the new UK vaccine bank, providing expert scientific consultancy to ensure that the tenders governing these banks invited bids for effective vaccines and with appropriate consideration of aspects such as cold-storage and delivery of sufficient doses within a time-frame appropriate for rapid disease control. In liaison with the Virology and Pathology Departments, the team also contributed to the transfer of the three APHA EU Reference Laboratories (Avian Influenza, Newcastle Disease and TSEs) from APHA to laboratories in another Member State country. Official transfer was completed in December 2018. This project involved a rigorous examination of legislative, financial, and project commitments, as well as detailed and supportive transfer of knowledge and key laboratory materials to the new EU reference laboratories. Importantly, the agency retains either OIE and / or FAO Reference Laboratory status for these diseases, providing a platform for continued influence and engagement at an international level. The project also included work-streams that leveraged the opportunities this international status provides to establish international reference laboratories for a broad range of high-impact diseases throughout the agency. As a further example of increasing international outreach, ID team members in liaison with the Bacteriology Department took a lead role in the establishment of a new International Reference Centre for Antimicrobial Resistance. This has been formed together with two fellow agencies within Defra, and provides a strong example of collaborating to maximise impact. Defra provides funds to support the reference centre and an application to the Department of Health Social Care’s Fleming Fund for a grant was successful, with funds being committed over two years. The purpose of this reference centre is to support capacity development in investigating antimicrobial resistance and antimicrobial use in low and middle income countries, see our recent blog for further details. EU Exit presents many new opportunities for APHA, Defra, and the UK, enabling enhanced engagement, status, and influence at a global level. The UK has taken a lead role in projects such as the Global Health Security Agenda and STAR-IDAZ. The ID team has been working with Defra in contributing to these and similar projects by providing expert advice and consultancy on animal diseases, zoonosis and antimicrobial resistance. To build and strengthen bi-lateral relations in fields such as animal disease the ID team has also hosted several missions from abroad, such as one from Ukraine, (please see our blog) which has led to new partnerships and joint projects. The ID team also helped develop links with Commonwealth countries at the Science, Research and Innovation Event held during the Commonwealth Heads of Government Meeting (please see our blog for further information). This brief summary provides just an outline of the ID team’s work in 2018. We now look forward to the many challenges and opportunities expected in 2019. For further information, please contact the APHA ID team Mailbox (APHAEUExitIDP@apha.gov.uk).